This method yields half a dozen $3 t-shirts in about an hour. If they are made in the afternoon, they can be worn the next day (depending on the type of fabric paint used.) 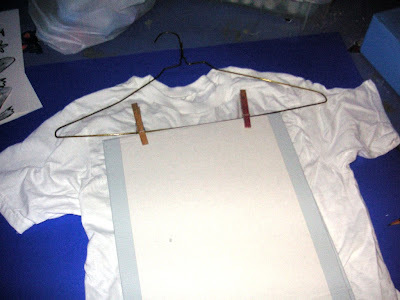 I have used this method many times to create quick (overnight) inexpensive ($3/shirt) relatively-identical team shirts from on-hand (or easily obtained) materials, without any artistic ability required. To expand this procedure to a team's worth of shirts (half a dozen to a dozen, usually), complete each step on every shirt, one step at a time. Do not proceed to the next step until you have finished the current step on all the shirts. The first step is to find a picture to use that has simple lines. Something that seems like a coloring book picture is best, with a simple outline that can be 'colored in' with solid colors. 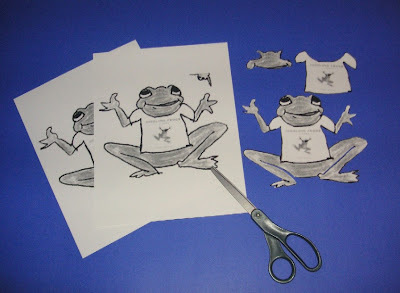 You can use a coloring book page, clip art, or something you draw. The simpler the picture, the better. Print (or photocopy) the picture onto card-stock, enlarging it if necessary. Print multiple copies of the picture on card-stock. I printed four for this example, but only needed two. The more complex the picture, the more copies to print. Cut one picture around the outline, cutting along the middle of the line that defines the outline. Cut another picture to make the guidelines for the internal details. 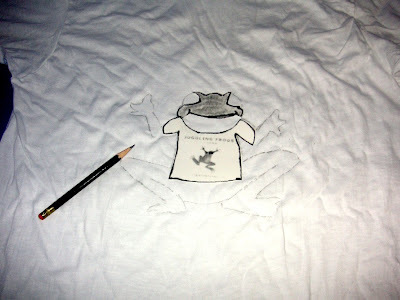 If a detail is too complicated to template, it will likely be too complicated to outline with fabric paint. 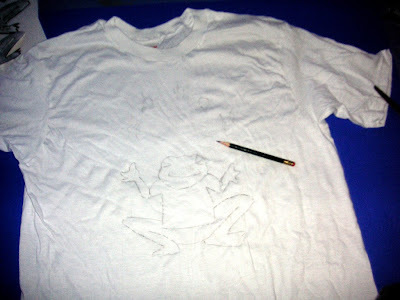 Using a pencil, trace the outline template. The baby frogs in this example were sketched freehand, in the vaguest of shapes. Perfectionism is your enemy in this activity. For team shirts, it's more important that they are alike and done than that they are great art. If they are alike enough, anything you do will look intentional. Trace the details using the internal-details templates. Prepare a sheath of newspapers or a piece of cardboard (shown) attached to a clothes hanger with clothespins. This will prevent the paint from soaking through to the back of the shirt. It will give a smooth flat surface to paint. It will also expedite the hanging of the shirts. When making multiple shirts, this step is a lifesaver. This step saves you from wrestling wet fabric painted material onto hangers. 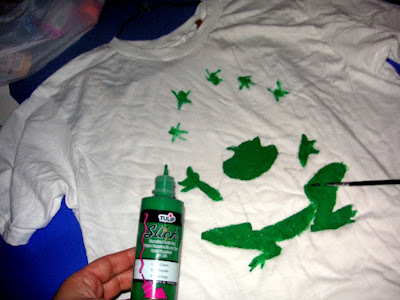 Fill in the colors with fabric paint, using one color at a time. 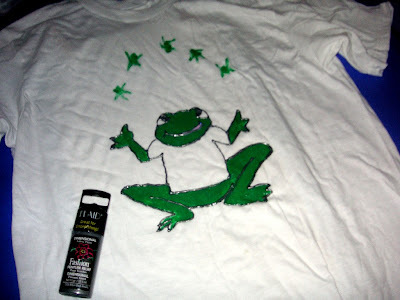 In this example, for multiple shirts, do all the green frog bodies on all the t-shirts at once. Then move on to another color for each shirt. Painting in this 'assembly line' fashion helps maintain the uniformity of the design across the collection of shirts. I use the most inexpensive fabric paint at the craft store. It often goes on sale 4 for $1. It's worth having on hand, so I stock up with the most frequently used colors. Directly from the bottle, using the pointy tip, complete the outline with dark paint. Carefully separate the wet shirt design from cardboard. Stretch the design so it won't stick to itself, and use clothespins to hold it, stretched a bit, to the cardboard. The fabric paint instructions will tell you how long to wait before washing (usually 24-48 hours), but they are usually dry to the touch after an hour or two, and wearable (without washing) the next morning. Okay. I am feeling so inadequate. Is there anything you don't do efficiently and well? Thank you for the kind compliments but, I beg to differ! The point is that this is EASY to do, and takes no special talent. It's a very forgiving project, and allows a busy mother to churn out six almost-identical team shirts while dinner bakes, without paying too much attention! The real trick is keeping fabric paint and spare shirts on-hand, for when the kids promise their teams that they'll bring in shirts for the team and then come home and share the good news after dinner: the shirts are due tomorrow. I have used my husband's (unopened, unused) spare undershirts in a pinch (less than $2 each). Last week, our local drugstore sold colored solid shirts for 4 for $10. Wow! Juggling frog, you really know how to do alot of thing! Would you ever register the T-shirt somewhere, like for sale? I tihnk Dufan Akuma was talking about a site that sells you T-shirt designs....but then again you can do it yourself. I must learn from you. You are so efficient! If you are still doing the enneagram, are you a ONE? Thank you! I'm not familiar with Dufan Akuma. 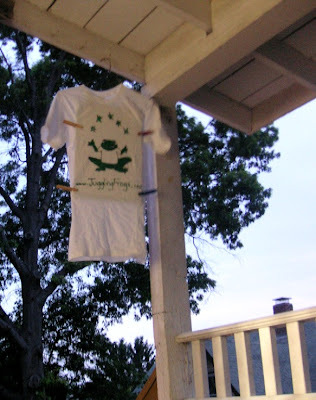 Curious Jew has been collecting t-shirt ideas for Jblogs (or the Jewish Blogosphere) lately. I only did a quick on-line test about the enneagram, but the answers were all over the place. My highest scores were in 2, 8 and 9. Those personality tests are fun, but I don't have much confidence in them. I test differently, depending on my daily mood. I often find I'm resisting both answers in the forced-choice type of test. Liz at Successful and Outstanding Blog did a whole series on the enneagram a few weeks back. I found the test from a link in one of her blog posts. Wow that is sooooo cool and you are way cool! 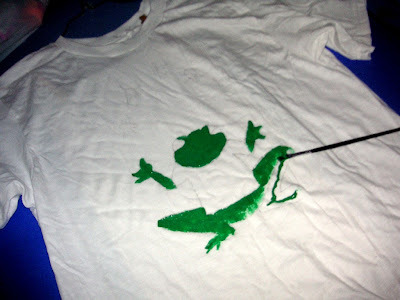 u gonna wear the juggling frogs shirt? When my kids saw me making the shirt with a template, they ALL claimed one... But there was only one! 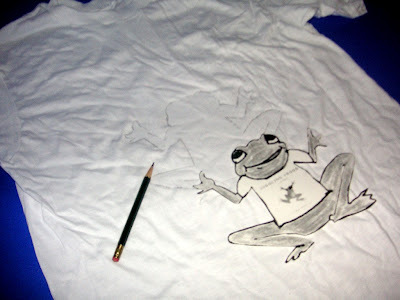 They all expected to get shirts, because that's usually the result of this template method. I think I'm in trouble! Any suggestions? make more? have a raffle? organize a kid-with-the-cleanest-room-is-the-winner contest? do a shlomo hamelech trick and pull out a scissor?